Today we celebrate the 30th anniversary of The Wharf's first opening night. On Thursday 17 January 1985 at 8pm, a trio of short plays – Late Arrivals by Pamela van Amstel, Perfect Mismatch by Kathy Lette, and The Bourgeois Wedding by Bertolt Brecht – was staged together as one program. Across the subsequent two months, a total of 10 short plays were presented in a mix of three-way arrangements. 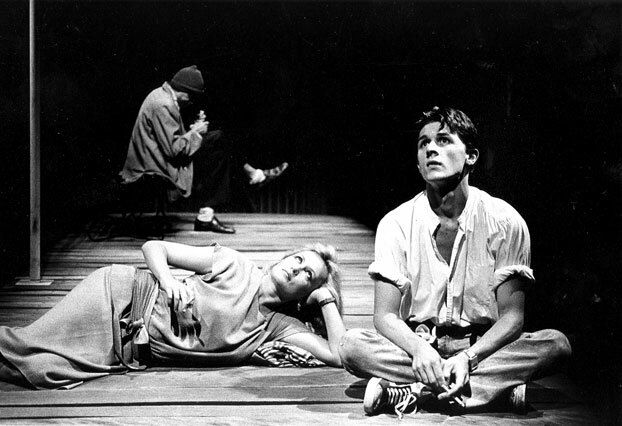 There were five plays by female Australian writers and five plays from international male writers. Wherrett hoped the resulting season of work would be "boisterous and whimsical, angry and silly, vulgar and refined!" The first of the short plays on opening night was van Amstel's Late Arrivals, which marked the directorial debut of a future STC Artistic Director, Wayne Harrison. The cast was Drew Forsythe, John Polson, Kate Fitzpatrick, Katrina Foster and Diane Smith. Late Arrivals was, appropriately enough, set on a defunct wharf. In the photo above, we see Drew Forsythe (at the back) with Kate Fitzpatrick and John Polson. Next up, Lette's Perfect Mismatch (pictured above) was directed by another future STC AD, Robyn Nevin, with Katrina Foster and Lewis Fitz-Gerald performing. And the Brecht was directed by Phillip Keir, with Terry Bader, Gary Files, Drew Forsythe, Lewis Fitz-Gerald, John Polson, Diane Smith, Melissa Jaffer, Kate Fitzpatrick and Katrina Foster. The social pages reported that everyone from James Reyne to Margaret Whitlam was in the crowd, and they all seemed to love the new venue: "so special that companies are queuing up to book it for private parties… you’ve got to get down there for the sheer beauty of the building and the waterside setting." The Sun-Herald reviewer Mick Barnes wrote, “the theatre itself – the most comfortable in Sydney – works well, with good viewing and acoustics from every part of the auditorium." 2SER’s Sunday Arts program called it, "the most exciting foyer now available in Sydney theatre. By day or by night, the full panorama of the harbour is a spectacular setting for the foyer space. Inside the larger of the two spaces, the new theatre has excellent sightlines, and very comfortable individual seats. There is about the whole project, with its industrial associations and its plain but comfortable setting, a lot of the exciting feel of the old Nimrod, a kind of subliminal buzz of expectation, and I think that Sydney's theatre-going habits are due for a quite profound change." Read more about how The Wharf came to be in this essay by Jo Litson. 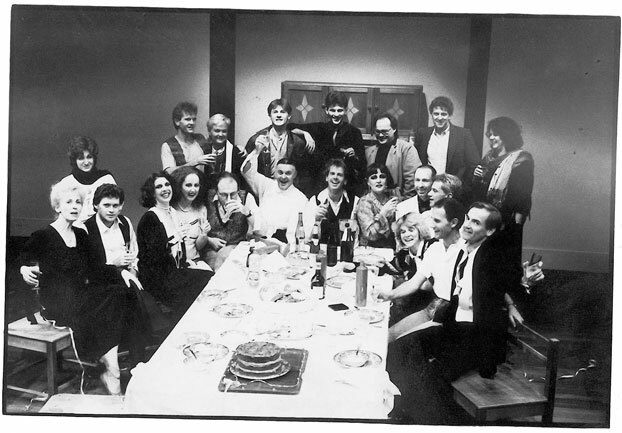 Above: The closing night of Bertolt Brecht's The Bourgeois Wedding. All production photos by Andrew Southam.